In case there was ever any doubt in your mind, human beings love their pets. No country is without its significant percentage of pet owners, and according to research by GFK, more than half the world’s population co-habits with at least one domestic animal. The UK is no exception. 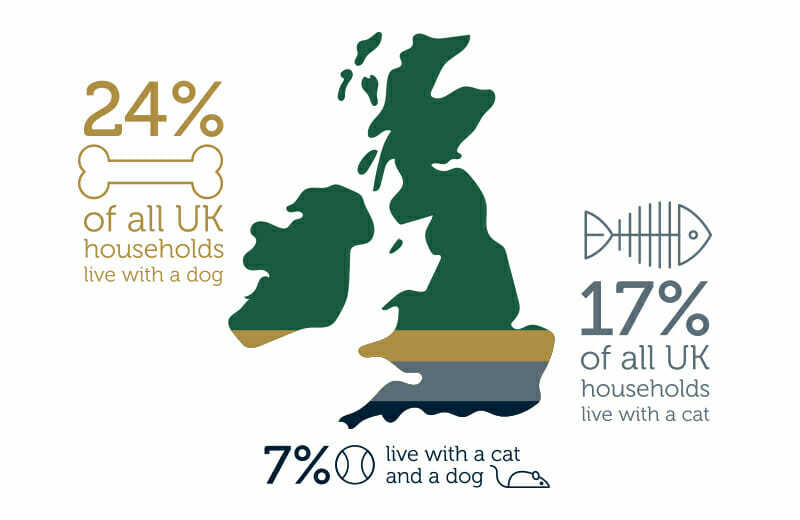 While we have a long way to go to match the global champion pet owners of Argentina, Mexico, and Brazil, where 80%, 80%, and 75% of the respective countries households own a pet, the UK still boasts a massive 44% with an animal companion. Throughout the world, dogs are the most popular pets, with 8.5 million canines living in 24% of all UK households. This is followed closely by the 8 million cats in 17% of households. Yet, while the majority of pet owners feel the need to choose between a cat and a dog, 7% of UK households love our favourite furry companions so much that they are home to both. This might seem counterintuitive to many. Don’t dogs chase cats? And don’t cats prefer a relaxed home to one with a bounding, excited dog running around? After all, the phrase “fighting like cats and dogs” has been around at least since the 16 th century, and it’s of little wonder; after years of breeding dogs to chase small animals that flee, it is only natural that they should want to chase a frightened cat. Equally, a dog that is on the receiving end of a cat’s claws is unlikely to want to spend too much time near other felines. Fortunately, this is something of an unfair stereotype. In truth, most dogs and cats only squabble as much as they do with any other animal, even amongst their own species. In fact, with a little bit of understanding and training, cats and dogs can live together as happily as any other pets. It just takes some consideration of what each animal likes and dislikes, their preferred eating, sleeping and playing habits, and an appreciation that they are territorial animals who like to know what does and does not belong to them. Like most things in life, familiarity breeds affection, and with a little preparation, your home can welcome cats and dogs together. That’s where this guide comes in! By covering the psychology of both cats and dogs and the various scenarios in which they might come to cohabit, we will explain the best ways you can prepare your home for the two different species to live together peacefully and happily. We will also consider some of the special case scenarios and surprises that might catch you out, and how to deal with them, as well as identifying the best breeds of both cats and dogs when it comes to sharing their living space with one another. Despite the natural inclination of cats and dogs to combat each other for space and territory, one of the reasons they are the UK’s most popular pets is because we have bred them over thousands of years to display less aggression, to be less fearful, and to be more social. As when getting any new pet, owners must set boundaries as well as understand and allow for the preferences of their new companion, which includes taking into account their physical and psychological needs. Raising a young kitten means letting it know when it is being too aggressive, and training a puppy means helping it to learn which behaviours are appropriate and which are not. The same goes for cohabiting a kitten and a puppy at the same time, only you need to account for the needs of both and their reaction to each other. While keeping them separated, use an item of bedding or something that has been used for several days as it will have a stronger smell of the animal on it and leave it with the other pet. Place each animal’s scent near items that the other uses: their bed, their toys, etc. This will allow each pet to not only get used to the other’s smell. Ensure that smelling the other’s scent is a positive experience. You could treat them as they smell it, or place it on/next to you whilst you give them affection. Ultimately, this will serve to calm each pet when they finally meet each other, as something will be instantly familiar to them both. Like introducing two cats or two dogs to one another, it is hard to predict how a cat and a dog might react when they first meet one another, so introduce them gradually and under your close supervision. Find a safe space in your home or garden where both animals feel comfortable, but which is not too small. Both should feel that they can retreat to a safe distance at any time if they are feeling threatened. Allow escape routes – e.g. don’t use a place where there are a lot of corners to get trapped in. Maybe consider opening doors. Alternatively, if you’d rather keep them in separate spaces to begin with, try introducing the two with a barrier in between them. Try to choose a barrier that allows them to see and smell each other. Avoid placing both animals in their crates and introducing them this way, as the lack of freedom to back away or escape will likely make either or both animals feel trapped and anxious – which are not nice feelings to associate with the other at their first meeting. Show both your puppy and kitten attention and affection separately, allowing each one to see you interacting peacefully and happily with the other. By learning that the other is not a threat to you, you have begun to teach each pet that they can also trust each other. Keep your dog on the lead at first. Try and keep the lead loose to avoid tension building up from restraining the animal. The lead should be used as a safety option if something goes wrong. They may want to chase your cat and might not even know not to try and bite. For some breeds, this is in their nature. Also, a nervous cat might swipe its claws at the dog, aggravating the dog to respond. So, keep the lead handy until your dog and cat are comfortable with each other. Because dogs need to be walked two to three times a day, we tend to train them to do their business outside the house. So, once you have housetrained your dog, their toilet habits are very straightforward. They prefer an outdoor space anyway, they can decide where they want to do their business based on the other scents around them, and so they can scoot their bums along the grass to clean up if necessary. preferably in the quietest part of your home, is the best way to help your kitty feel comfortable. This means setting a few rules for your dog, who would love nothing more than to get into this room and have a good rummage around. Your dog should not be able to access this space under any circumstances. If your cat senses the dog has been in the room and got his or her scent on the cat’s things, your kitty is likely to want to abandon the space altogether. This is especially true of the litter box, which – try as you might to ignore this – dogs may enjoy burying their nose in and eating the contents. Even if you cannot keep the cat’s space entirely separate from the dog, a cat’s litter box is its throne and any disturbance will stress him or her immensely. So, make sure the cat’s tray is in a small or hard to reach space that dog will never be able to access. Unfortunately, just the presence of the dog lingering outside this space could also be enough to distract your cat and make him or her feel anxious in the one place they should be able to relax, so discourage your dog from sniffing around outside or from trying to get in by training him or her not to go to that particular part of the home, or by using a barrier to keep them away. If you’re fortunate to have a second floor in your home, you might want to try encouraging your cat to use a space upstairs, while using a stair gate to keep your dog downstairs. Of course, that’s not to say that just because the cat can eat in peace that it’s okay for the dog to have its dinnertime disturbed. Fortunately, cats are less likely to try and eat from another animal’s bowl as they are very picky about what and where they eat. It is important to remember that cat’s diets and dog’s diets are very different. We cover this in more detail later, but the most important difference is that cat food contains much higher levels of protein .This might get your dog licking its lips, but too much cat food is likely to make your dog sick in the short-term, and in the long-term it can cause nutritional imbalance and make him or her overweight. Keep your cat’s bowl out of reach of your dog. Try placing it on an elevated surface where the dog can’t reach it, but where the cat can still eat comfortably. Serve their food at the same time. This makes it easier for you to organise meal times, and each pet will be distracted with their own food while the other eats, too. While your dog is the one that is more likely to cause severe or even fatal damage to your cat if he or she feels kitty is a threat or doesn’t belong in the home, your cat can still do permanent damage with their number one weapon: their claws. A quick swipe can be enough to make the dog never want to approach the cat again, making for an uncomfortable living environment and a dog that feels permanently afraid. Do not declaw your cat. By removing this defensive capability completely, he or she will feel completely vulnerable to attack, making her less likely to feel secure in your home. Besides, it’s a painful procedure that he or she needn’t experience. However, by keeping your cat’s claws trimmed – in the case of indoor cats – he or she can still give your dog a quick warning swipe which will serve to teach them to keep their distance or learn when they have gone too far, without causing any lasting damage to the dog or to their relationship. Your goal should be one of a comfortable tolerance between the two pets. While we all dream of coming home to find the kitten curled up on top of the dog, or your new puppy accepting the family cat as its surrogate big sister or mum, you cannot force this relationship. Don’t worry if your pets ignore each other for a while and make sure they have their own space to relax. Instead, focus on creating an environment where the two can feel at ease with each other. Training your dog to be obedient means they will be less likely to try and invade the cat’s space and your cat will be able to relax. Encourage your cat to relax in the same room as the dog by encouraging them to use a high-up space or on a cat-tree. This is especially useful if your dog gets excited at sounds from outside or the arrival of visitors, as it will give your cat some peace of mind that he or she won’t be stepped on when your dog starts hopping around excitedly. By training your dog to respect the space and privacy of your cat, the two will be able to feel at ease whith each other, eating and relaxing in the same room. As they become more familiar, they will likely begin to show affection for one another, but even if they don’t, try not to worry. As long as they are not chasing each other, showing aggression, or eating the other’s food, you have done your job and successfully introduced the two to each other. While two human beings showing indifference to each other might mean they don’t like each other, between two animals, this is a sign of trust. Allow them to get more familiar with one another over time and, sooner or later, you might even catch them having a cheeky cuddle. While we have covered the general rules, which should always be considered when helping a cat and a dog cohabit with one another, different circumstances call for different types of intervention, planning and preparation. Here, we look into these cases in a bit more detail and offer guidance for how to approach these particular situations to ensure the best for your pets while continuing to help them become familiar with one another. Adopting a young kitten and a young puppy at the same time (or near enough) is the ideal way to ensure your pets form a close but respectful bond. Being in each other’s lives from the start will help them to feel closer to one another and more accepting, and they will learn the limits to each other at the same time as learning their own limits and the rules of the home. It’s true that you will have all the other issues to deal with, like helping your new pets feel settled, finding their favourite food, helping them sleep and get used to being alone, and training them, but they should get on with each other fairly well. That being said, kittens can be quite fragile for the first few months, and while they enjoy playing, their attention spans are much shorter than dogs. On the other hand, puppies learn to play by wrestling one another and can often keep going until they are so tired that they fall asleep. Encourage the two to play with each other. It is a great way for the two to bond and learn what the other likes and where they draw the line. Let kitty call the shots. If puppy gets too rough or your kitten simply wants to rest, allow them to leave. If your puppy still wants to play, you can always take over! Play without gloves on your hands so he or she learns when they are being too rough by observing when you pull your hand away. This will also help him or her learn their limitations when playing with kitty. It’s worth noting that they will go through similar stages as they grow. 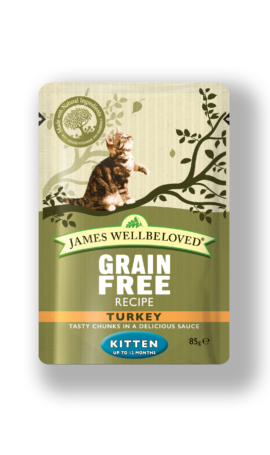 Both will have weaker teeth and jaws at first, so wet food is a good way to encourage them to eat, but dry food and kibble is great for helping them to strengthen their bite and to grow healthy teeth, so you may want to offer a mix. They are also both likely to start maturing to adulthood at between 6 and 12 months, so it is during this period that you will want to start transitioning to adult food, which contains less calcium and protein (and other nutrients) than the younger counterparts. Puppies and Kittens have different nutritional requirements; dogs are omnivores, but cats are carnivores. So, whilst a little bit of the other’s food is not dangerous in any way, it could easily become a problem if they were regularly getting more than 10% of their daily allowance as the wrong food. As you can imagine, getting mature animals to get along is going to be trickier than getting two newborns. In a counter to the advice about adopting two young animals, older cats and dogs are much better at holding in their toilet business, even if they aren’t properly housetrained and, with a full set of mature teeth, are less likely to want to chew everything. Better still, they will already be on an adult diet. 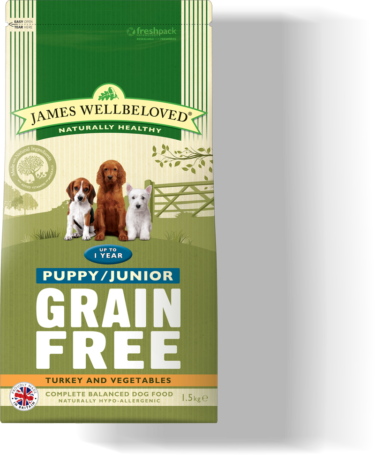 While you’ll still need to keep the puppy food separate from the cat food, you should only need to feed them once or twice a day. However, getting older animals means adopting their oft-unknown histories and their unpredictable behaviour. Dogs that have no experience of being up close and personal with cats are likely to want to chase them, and an adult dog with all its strength can be harder to restrain, so the leash or a physical barrier are essential when introducing the two pets. A formerly wild or outdoor cat may have had its fair share of run-ins with dogs and so considers them as the enemy. You can always teach an old dog new tricks – it might just take a little longer. Have patience as the two adapt to behave and consider using a clicker to help speed up and comfortably train your new pets behave. laymate and leave your cat in peace. In the event that the two do play with each other, you will be able to feel a bit more confident letting the puppy play with a fully mature cat, who will be less fragile than a kitten. Naturally, you will need to let the older cat set the boundaries. When he or she has had enough, you may still need to intervene. Your puppy probably won’t do any physical damage to your cat, but if he or she pushes too far, they might damage any hope of your puppy and cat developing a close bond. This situation calls for a bit more attention. If a puppy can cause harm to a small kitten, imagine the damage a fully grown adult dog could do. This is further confounded if your new dog has little experience with cats, or all its experiences involved chasing. A slow and restrained introduction is vital again, but more than ever it will require you to be extra vigilant. Chances are, once your dog has understood that kitty is here to stay, he or she will become accepting and even protective, but you should never assume this until weeks or even months have passed without incident. Watch for any signs of your dog becoming agitated or over-excited. He or she might enjoy playing with your kitten to teach them their boundaries, but a strong bite, even an accidental one, could be fatal. We also recommend feeding them in separate rooms, at least until your kitten is able to climb to a higher surface. Otherwise, your older, stronger dog might be able to too easily muscle his way over to eat the kitten’s food . A male dog is a lot less likely to feel threatened by a male cat as opposed to another male dog, and vice versa. However, you should still be cautious when bringing in two male animals into the same house – especially, animals like dogs and cats who can be rather territorial. Male dogs can live with other male dogs and get on just fine, just as male cats can live with other male cats without a hiccup. However, you should always expect that they might challenge one another for dominance, and this is also true of a male dog living with a male cat. It is even more important that you are vigilant between the two as, depending on the breed of your dog, he or she could potentially cause permanent or fatal injuries to your cat. There are a few things you can do to try and offset any potential aggression. Raising them both from juvenile is a great way to establish early trust between the two, though it is still no guarantee that no violence will ever occur. Neutering one or both of them is likely to lessen some of their natural desire to compete or fight. Regular daily exercise will help them to expend any pent-up energy and aggression. Getting two female pets is no guarantee that fights won’t still happen, but there is no doubt that the risk is far less. Your dog and cat may still compete for territory and preferred spaces every so often, but you don’t need to worry about either challenging the other for dominance or the onset of puberty suddenly changing their formerly docile natures. If you have young children in your home or simply don’t want to have to constantly worry about the possibility of your pets suddenly lashing out at each other for seemingly no reason, it is less risky for you to get at least one female. Bringing a new cat home of any age to live with your already present dog involves much of the same rules as before, with one key exception – this is your dog’s home! Rather than meeting on neutral ground, your dog will have already established your home as his or her territory. This could result in your dog wanting to defend its territory and protect you and your family from what your dog considers to be an invading animal. Dealing with this requires some careful planning. Follow the general rules we discussed earlier, but take a little longer to mix the scents of the two animals before introducing them physically. When you do introduce them face to face, do so on neutral ground first, like at a friend’s home. This will help your dog get used to the cat before he or she has to comprehend this cat sharing its living space. When the two do at last meet in your home, be extra careful to supervise their time together. If your dog shows signs of discomfort, restrain your dog and bring the interaction to an end, gradually making their meetings longer and longer. Your cat will still need its own space, but don’t give it a space that the dog is familiar with. Instead, find a space where your dog doesn’t spend too much time. If you don’t have such a place, take some time before bringing the cat home to carve out a space by placing a barrier between the space and your dog or training your dog not to go into that area anymore. Be patient with your dog and understand why he or she is upset and having to share a territory that was formerly only his or hers. Remember to show them lots of attention so they understand that they will still have everything they had before, including your love, so they realise the new cat isn’t a threat to them. The general rules apply to this scenario, too, only this time, you must understand that it is your cat who will feel like their home is being assaulted. While your cat is able to do far less damage to your new dog, they may still act aggressively, potentially injuring the dog or aggravating the dog into fighting back. Also, adding a bounding, energetic dog into the long-time, peaceful home of a cat is a sure-fire way to cause the cat to feel high levels of stress. Again, try to introduce your two pets on neutral ground while subtly getting them used to each other’s scents. Move the dog’s scent throughout the house so your cat gets used to it being around, but keep the dog’s scent clear from your cat’s private space so you don’t disturb his or her eating, sleeping and toilet habits. Try to keep your new dog confined to just a few rooms in the house at first, gradually letting him or her explore more of the space and spending more time with your cat, but take care that the dog never has full access to the whole home so they understand the boundaries. Which breeds get along best? There is one more thing you can do to help your dog and cat get along well, and that is to get a breed which are more inclined to be friendly towards other animals. While every pet is different with their own personality and their own preferences, selecting from among the following breeds is a good start to creating a happy and harmonious home where you can trust both pets to get along. 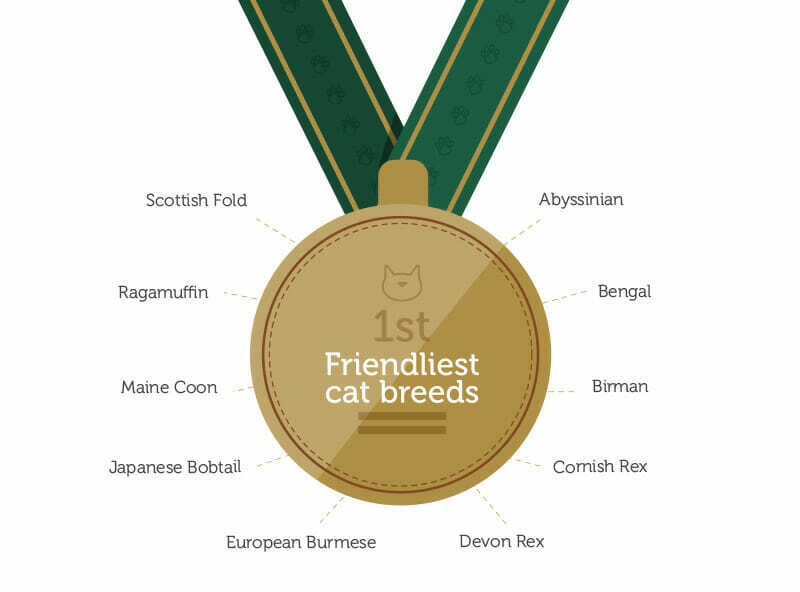 This list is by no means extensive and there are a number of breeds not mentioned here that might also be relatively friendly with a pet cat. As a rule of thumb, it is a good idea to avoid terriers, hounds and herding dogs, as these have been bred not only to chase small animals, but to catch and even kill them. Even the following breeds, who are statistically safer with a cat, should be introduced carefully to give them the time and space they need to come to trust their new companion. Ultimately, how your dog reacts to a cat will depends on the dog’s individual personality. You should always ask previous owner/rescue centre what the dog is like with cats before adopting them. Similarly, this is not an extensive list and other breeds of cats might get along well with your dog. 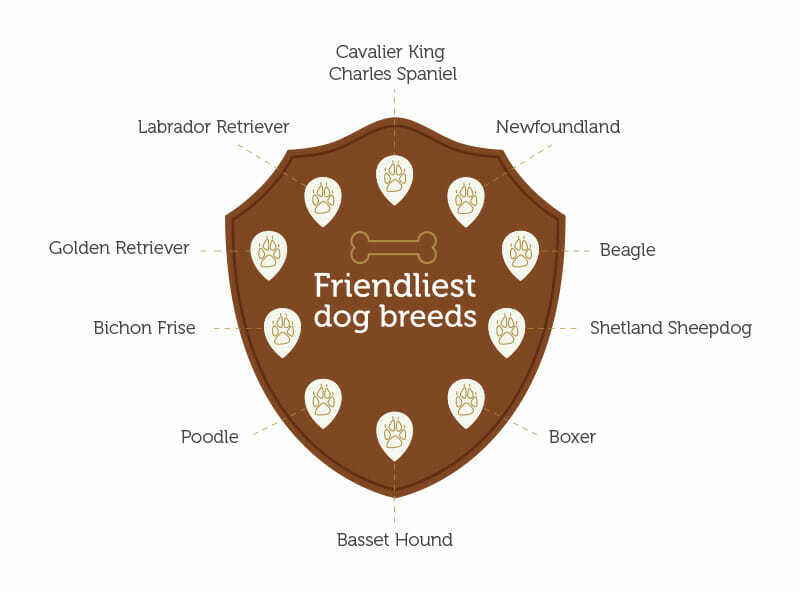 However, these are some of the breeds that are most tolerant of other animals sharing their living space. coexist happily. Given time, patience and training, with some careful vigilance, your cat and dog can become firm friends, and even learn to love each other. 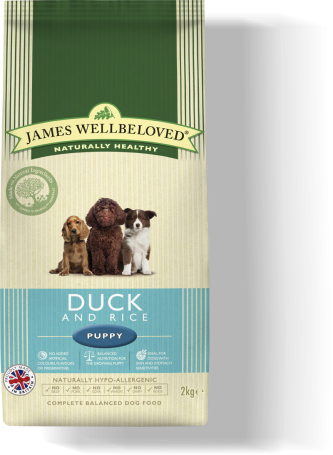 Puppy feeding guide: How much should I feed my puppy?